Baking soda, or bicarbonate of soda, can be used as a natural, non-toxic alternative for many cleaning and bath products. Drastically reduce your consumption, eliminate your use of toxic products, and save a lot of money with simple baking soda solutions. Using baking soda for bath and beauty needs, cleaning, deodorizing and other eco-friendly uses is easy. For solutions, stir together about 4 tablespoons (1/4 cup) of baking soda with 1 quart of water until dissolved. For pastes, stir together three parts of baking soda with one part water. For sprinkling, simply store baking soda in a jar or bottle with a shaker-type cap. Shampoo: Use baking soda as a shampoo, rinse, then use apple cider vinegar as a conditioner. Spa Bath: Add baking soda or bath salts to your bath. Toothpaste: Dip your wet toothbrush into baking soda to brush your teeth, whiten your teeth and freshen your breath. Teeth Whitener: Create a paste with a teaspoon of baking soda and water. Rub paste on your teeth once a week, let sit for five minutes, then rinse. Deodorant: Lightly pat baking soda under your arms. Mouthwash: Add one teaspoon of baking soda to a small glass of water. Exfoliant: Mix three parts baking soda with one part water to use as an exfoliant to gently remove dead skin cells. Rub in a circular motion, then rinse. Insect Bites: Make a paste out of baking soda and water and apply to skin. Clean Combs And Brushes: Remove oil build-up by soaking combs and brushes in a glass of warm water mixed with one teaspoon of baking soda. Rinse and let dry. Oral Appliances: Clean retainers and dentures with two teaspoons of baking soda dissolved in a cup of warm water. Hand Softener: Mix baking soda with warm water and rub on your hands to clean and soften. Rash: Use two tablespoons of baking soda in bathwater to relieve rash. 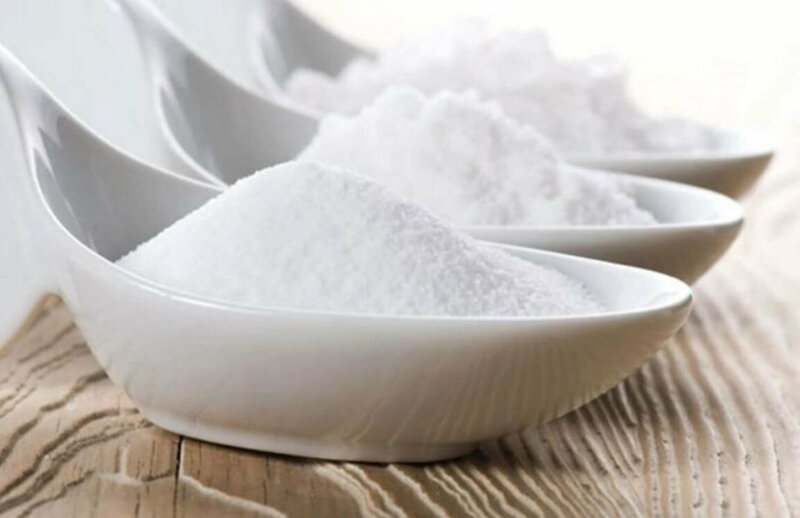 Antacid: Use baking soda to relieve heartburn, stomach upset and acid indigestion by drinking half a teaspoon of baking soda mixed with half a cup of water. Canker Sores: Used as a mouthwash to relieve canker sore pain. Windburns: Moisten baking soda with water and apply. Feet: Soak your feet in a warm bowl of water with three tablespoons of baking soda. Sunburn: Apply a paste of baking soda mixed with water. Bee Stings: Create a poultice of baking soda mixed with water. Measles And Chicken Pox: Relieve general skin irritations such as measles and chicken pox by adding baking soda to your bath. Itchy Skin Relief: Mix baking soda with water to create a paste – then rub it on your skin. Splinters: Splinters come out naturally after a few days of soaking in baking soda twice a day. Ulcers: Baking soda neutralizes stomach acid and is beneficial for ulcers. Add a pinch of baking soda to your drinking water. Cancer Prevention: Eating baking soda can offer nutritional and immune support for people with cancer. Add a little baking soda to your drinking water. Baking soda increases the pH of acidic tumors without affecting the pH balance of healthy blood and tissues. A pH imbalance causes unhealthy organisms to flourish, damaging tissues and organs and compromising immune systems. Exercise Enhancer: Mix a pinch of baking soda in your drinking water before workouts. Baking soda absorbs lactic acid in muscles during vigorous workouts, prolonging fatigue and enhancing athletic performance. Kidney Function: Low-functioning kidneys have difficulty removing acid from the body. Baking soda buffers acids and maintains balanced pH levels in your body. Soft Scrub: Sprinkle baking soda on a damp sponge to scrub bathtubs, showers, tiles and sinks – then rinse and wipe dry. Vinyl Shower Curtains: Sprinkle baking soda on a damp brush to scrub shower curtains, rinse and allow to dry. Toilet Cleaning: Add one cup of baking soda to the toilet and scrub. Clogged Drains: Unclog your drain with one cup of baking soda and one cup of vinegar. Laundry Detergent: Use half to 1 cup of baking soda in the wash cycle to get clothes clean and smelling fresh naturally. Laundry Detergent Boost: Add half a cup of baking soda to detergent to get clothes brighter. Pre-Soak: For heavy odor and dirt issues, use baking soda as a pre-soak. Dissolve 1 cup of baking soda in warm water. Fill the washer or sink with water and add the dissolved baking soda and clothes to soak overnight before washing. Fabric Softner: Add half a cup of baking soda to the rinse cycle to balance pH levels and suspend detergent or mineral deposits in the water that make clothing feel stiff. Iron Cleaner: Remove built-up starch and scorch deposits from irons with a mix of baking soda and water, then wipe the plate with white vinegar. Cloth Diapers: Add half a cup of baking soda to 8 cups of water to soak cloth diapers. Floors: Mix half a cup of baking soda in a bucket of warm water. Mop and rinse clean. Microwave: Sprinkle baking soda on a damp sponge or cloth to clean inside of microwaves and remove odors. Cookware: Shake baking soda onto pots and pans, add hot water and soak for 15 minutes before washing. Oven: Sprinkle baking soda on the bottom surface of your oven and spray with water. Allow to sit overnight, then scrub and rinse. Cookware Oil And Grease: Add a heaping scoop of baking soda to your regular dish soap to help cut oil and grease. Dishwashers: Deodorize and cleanse your dishwasher by adding baking soda to the wash cycle. Dishcloths: Sweeten sour dishcloths with baking soda. Cutting Boards: Sprinkle baking soda on cutting boards, scrub and rinse. Drains: Unclog your sink with one cup of baking soda and one cup of vinegar. Polish Silver: Mix baking soda and water to create a paste and rub onto silver with a clean cloth, then rinse and dry. Stainless Steel And Chrome: Rub with a moist cloth and dry baking soda. Rinse and dry. Fridge And Freezer: Clean with baking soda sprinkled on a damp cloth, then rinse. Food And Beverage Containers: Wash food and beverage containers with baking soda and water. Melted Plastic Bread Bags: Use baking soda to remove melted plastic from bread bags by dampening a cloth and creating a mild abrasive with baking soda. Counters: Clean with baking soda sprinkled on a damp sponge. Thermos Bottles: Wash out with baking soda and water. Coffee Pots: Clean glass or stainless steel coffee pots (but not aluminum) with 3 tablespoons of baking soda mixed with one quart of water. Coffee Makers: Run coffee maker through its cycle with a baking soda solution, then rinse. Garbage Disposals: Eliminate odors by slowly pour baking soda down the drain while running warm water. Barbecue Grills: Sprinkle baking soda on barbecue grills, let soak, then rinse off. Garage Floors: Sprinkle baking soda on greasy garage floors. Allow to stand, then scrub and rinse. Repel Rain From Windshields: Apply gobs of baking soda to a dampened cloth and wipe windows. Patio Furniture: Sprinkle baking soda under chair cushions to freshen patio furniture. Weeds: Sprinkle baking soda between the cracks of your walkway to keep weeds away. Cars: Mix baking soda with warm water on a soft cloth, brush or sponge to clean off dirt and bugs. Garbage Cans: Wash garbage cans with baking soda and water. Hands: Remove odors from hands by wetting hands and rubbing them hard with baking soda, then rinse. Furniture: Sprinkle baking soda on a damp sponge and rub furniture lightly. Wipe off with a dry cloth. Surfaces: Clean and remove stains from marble, formica and plastic surfaces by scouring with a paste of baking soda and water. Batteries: Create a baking soda paste and apply with a damp cloth to scrub corrosion off batteries. Use caution as batteries contain acids. Disconnect battery terminal before cleaning, and to prevent corrosion wipe on petroleum jelly. Oil And Grease Stains: Sprinkle baking soda on oil and grease and scrub with a wet brush. Crayon Marks On Walls: Add baking soda to a wet cloth to remove crayon marks on walls. Air Freshener: Add one tablespoon of baking soda to water and a little essential oil. Refrigerator: Place an open box of baking soda in the refrigerator. Rugs And Carpeting. Sprinkle baking soda on rugs and carpet, wait 15 minutes or overnight, and vacuum. Garbage Cans: Sprinkle baking soda on the bottom of garbage cans. Sports Gear: Sprinkle baking soda into gym, sport and golf bags. Closets: Place an open box of baking soda in closets. To ward off moths, add a few drops of lavender oil. Toilets Odors: Add one cup of baking soda to the toilet and allow to sit an hour before flushing. Stuffed Animals: Clean stuffed toys by sprinkling them with baking soda; brush off after 15 minutes. Fireplaces: Reduce soot odor by cleaning the ashes out of your fireplace and placing a bowl of baking soda inside. Vacuum Cleaners: By vacuuming baking soda into the vacuum cleaner, you deodorize the vacuum. Shoes: Shake baking soda into shoes. Dry Bath: Sprinkle baking soda on dry fur, brush it in then brush it out. Keep away from eyes. Wet Bath: Bathe your dog with a solution of 1 tablespoon of baking soda for every 1 1/2 cups of warm water. Let it soak into fur for a few minutes. Thoroughly rinse, then apply apple cider vinegar to condition fur – 1 tablespoon of apple cider vinegar per cup of warm water – allowing to sit for a few minutes. Rinse thoroughly, then dry. Keep both solutions away from eyes. Accidents: Clean up companion animal "accidents" by scrubbing the area with club soda, then allow the area to dry. Sprinkle baking soda on the area and let stand for a while, then vacuum up. Teeth And Gums: Brush your companion animal's teeth by dipping a damp, soft brush in baking soda and brushing gently. Animal Bedding: Sprinkle baking soda liberally onto pet bedding, allow to sit for 15 minutes before vacuuming. Animal Carpet Odors: Sprinkle baking soda on the carpet, let dry, then vacuum. Litter Box Odor: Layer the bottom of the box with baking soda, add litter on top. Litter Box Cleaning: Empty old litter and pour in a mixture of baking soda and vinegar. Let stand for 15 minutes, then scrub, pour out and dry. Cage And Crate: Scrub with a solution of baking soda dissolved in warm water. Rinse and dry. Dishes: Scrub dog and cat bowls with baking soda and water. Toys: Dissolve baking soda in warm water to wash pet toys. Rinse well and dry. Blankets And Towels. Add half a cup of baking soda to the wash. Skunk Odors: Combine 1 quart of hydrogen peroxide with 1/4 cup of baking soda and 1 teaspoon of grease cutting dish detergent. Wash your animal with the solution. Bee Stings: Remove stinger from animal if needed, then apply a baking soda paste. Nail Bleeding: If you cut your animal's nails too close and draw blood, dip the nail in baking soda and apply pressure. Bad Breath: Mix half a teaspoon of salt and half a teaspoon of baking soda with one cup of water in a spray bottle. Spray your animal’s mouth regularly. Produce: Scrub produce with baking soda under water to remove pesticides and residue. Baking: Baking soda, as its name implies, can be used as a leavening agent in baked goods. It causes dough to rise. Beans And Bloating. Sprinkle a teaspoon of baking soda in water while soaking dry beans to reduce bloating. Tea: Add a pinch of baking soda to a gallon of freshly brewed tea to remove bitterness and cloudiness. Lunch Boxes: Place a spill-proof box of baking soda in a lunch box between uses to absorb odors. Ants: Mix equal parts baking soda and salt and sprinkle in areas where ants are entering your home. Baby Bottles: Clean baby bottles with baking soda and hot water. Cloth Diapers: Dissolve half a cup of baking soda in two quarts of warm water and soak diapers thoroughly before washing. Diaper Rash: Add two tablespoons of baking soda to your baby's bath water to help relieve diaper rash. Play Clay: Combine 1 1/4 cups of water, two cups of baking soda and one cup of cornstarch. Baby Spit Ups: Moisten a cloth, dip it in baking soda and dab at the dribbled clothing. Baby Pools: Add baking soda to the bottom of a mildewed baby pool, then hose it down. Cut Flowers: Add a teaspoon of baking soda to a vase of flowers to expand their life. Fill Wall Holes. Mix baking soda with white toothpaste to fill holes in a plastered wall. Small Fires: Toss baking soda at the base of the fire to help put a fire out. Ashtrays: Remove odors from ashtrays with baking soda and water. Sprinkle dry baking soda in ashtrays to prevent smoldering and reduce odor. Canvas Bags: Use dry baking soda with a brush to rub canvas handbags clean.